To famed American author Mark Twain, Hawaii was "the loveliest fleet of islands that lie anchored in any ocean." His statement was surely meant to encompass more than the natural beauty of this Paradise of the Pacific. To Twain the songs and dances of Hawaii are among the loveliest to be found anywhere, and the traditional hula is now a worldwide favorite. A great feature of the dance lies in the manner in which the performer interprets the lyric. By delicate and graceful hand motions, the dancer weaves a story, telling in many songs of the islands' great scenic wonders, from cascading waterfalls and towering mountains to shimmering rainbows, sun-drenched beaches and the myriad, multi-hued blossoms of Polynesia. Or a hula may describe a fishing trip, the meaning of Aloha, the loveliness of an island maiden, the trade winds of Hawaii. The dance is an art form and, as such, is taught not only in the many studios which dot the island scene, but also in a course at the renowned University of Hawaii. In selecting the musical numbers for these recordings, the producers requested various dance instructors to list the most popular hulas taught in their schools. In disc one are the easy hulas which form a repertoire of standards for the beginner. 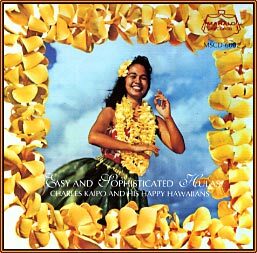 In disc two are the sophisticated hulas for the advanced student, the hula melodies most often used by the professional entertainers. Charles Kaipo Miller, Jr. came from a family of show people with the Alexander Pantages famed shows... circuses and vaudeville were Kaipo's training grounds. With a half-Hawaiian father as a tutor, Kaipo was weaned on Hawaiian music and was taught to play the guitar at an early age. He was the talented leader of the Happy Hawaiians. A quiet, unassuming young man of Hawaiian, Irish, and English descent, Kaipo possesses a rich and appealing tenor voice. Whether known as Kaipo or Charlie, he is a polished musician, composer, and arranger. All the numbers on these discs feature his arrangements, originally recorded in 1962.